This is our second try at fabbing this difficult shape. Our first attempt was at a somewhat smaller size and ran into trouble with the thin beams when *one* of our thin horizontal layers turned out to be too weakly bonded. To avoid a second failure, we enlarged the model but also ran the heater element very hot and for an extended period of time to make the pixels srong, but also larger, more rounded, and richer in color– a darker caramel. In this view we’re looking right down at the printed layers of sugar; we think that the grain of the layers makes this look a lot like a wood carving. The shape is a 3/4 twist mobius strip with a square cross section and windows cut at regular intervals in all of the sides the side. 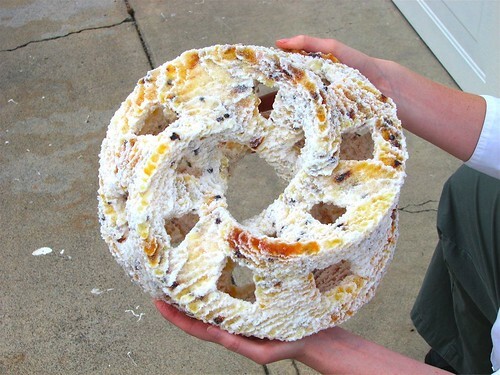 Even though it’s hollow, it still weighs seven pounds and fourteen ounces– that’s a lot of sugar. We’re bringing this monster to Maker Faire this weekend, so you can see it for yourself, too. This entry was posted in Art, CNC, EMSL Projects, Play with your food and tagged art, candyfab, cnc, food. Bookmark the Permalink. If you can get the 3-D data for it, you should try printing up a human skull. In Mexico, they make them by hand for the "Day of the Dead"
We actually have in the past made sugar skulls by the traditional means with a little skull mold. As Bathsheba notes (in this handout — PDF link), if you *can* make something by any other process, you should. Molding is fast and efficient for shapes that work well for it; It might get more interesting if we try to make a detailed 3D design for a skull that couldn’t be produced by molding. hmm interesting point which gets into the art of applying this fab-tastic new technology. as part of a cartooning project gone wrong, i have a collection of 3-d things of many types should you like [or be able] to use em as reference. what is best then ,something airy? a ribcage? how bout celtic knots finally all ropylike or those intricate interwoven monograms of olde? canst thou make a huge light chain? fab-oo on the wall, bank queue or garlanding the xmess tree. can it make ball joints, huge feathers, pleease more escher and "tiling"
once up n running it could be a way of shape testing anything structural from building/bucky fuller shapes to fan blades to [once safely fixed w laquer/epoxy for strength?] 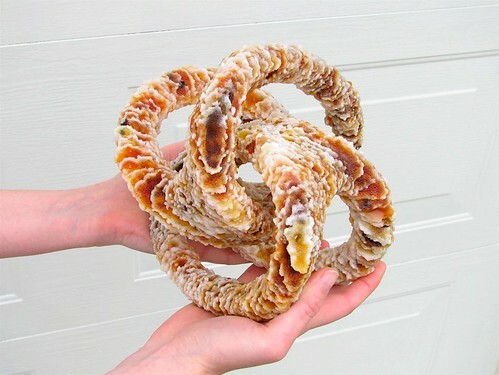 enormous bubblesoap loops, blown-up knitting, kite skeletons that can be lit to carmelize into thin air! gothic arches! yes id like to see that. your pointis AIR sculpture, no? or geometricity? yknow a skull is in fact a light intricate thing oft made dull n clunky etc by casting. isnt the spun sugar at certain thinnesses able to be translucent? perhaps what is wanted here is to use your cad program [?] to 3-d scan say a skull model i can offer, then adapt/select a section and then overlay a design [lace, filigree, knots net mesh textile patterns grids herringbone etc] and create say spun sugar skull masks for wall, plate or ritual. forgive me, just a thought or 9.
anything here worth a 2nd look. would love to know if there s kernal here of use. your work is totally exciting! Someone left a note about sorbitol on an earlier story about CandyFab– I’m certainly willing to try it, but I haven’t found a reasonably cheap source for 100+ pounds at a time. Almost certainly, the lower melting point and slower hardening would be a big advantage to prevent cracking in larger and more complex sculptures. How about using chocolate flakes, not chocolate chip, the flakes are more thinner but you will need an air conditioning room to make it. At the same time if you use wafer flakes can make a really yummy experience. However why you dont make a plotter cutter for food stuff, like chocolate, wafer, sugar paper, rice paper, etc. And if the plotter can cut many shapes, like circular, squares, etc will be nice. At the same time if you do a printer plotter for print in cookies, chocolates, gum paste, cakes, food in other words( no more than 3mm of thickness) and then the plotter cutter cut in the exact place that its the printed make you can make a nice interested machine(straight and circular cuts). The ink to use will be the same the the food coloring for pills. You’ve made several interesting suggestions here. 1. Yes, chocolate flakes would be fine, but fine granular media would be better yet. The trouble with either of these is that chocolate can stick together when pressed together (especially if warm) and that would be a problem. Chocolate chips are designed to not stick together– so they are a particularly good choice. We just need tiny ones. Even with air conditioning, it will be difficult to cool the middle of the bulk material when we’re heating the top. It might need something closer to a horizontal freezer. 2. There are already cutting plotters that can cut paper thin stuff (e.g., vinyl cutters), so there’s not really a need to build one. Cutting thicker things (like cookie wafers) would be seriously challenging, and probably needs something like a simple CNC routing table (CNC dremel?). 3. You can get food coloring printer cartridges for standard inkjet printers, which are used to print arbitrary things on sugar sheets that are then put on cakes. That might be a better place to start. Hey nice for the reply. Well I am in the chocolate business and I need to say that you are right, but tell me about the size of chips that you want to find, maybe I can help you to find some with my clients. Again if the chocolate have more cacao liquor than butter cacao is more difficult to dissolve, because its like a rock so hard that you need really more time than usual to melted, but its more expensive. Anyway Windell I want to know if you can make a DVD step by step process or maybe you can sell a machine like that to me, I am interested. At the same time if you can make a custom machine for us, but if you are interested I want to give you more information later. Its really not complicated but need a good creative person for saving space and money. Will be fun because is for the chocolate business. Have you attempted to polish any models yet? Sandblast, sand, bake, gentle touch of the flamethrower, etc. Well, not really. But, we have experimented with sugar "laquering" with a candy (saturated sugar solution) coating, local flame heating (CRACK! ), using the models as seeds for sugar crystal (rock candy) growth, and we just took a class on aluminum casting…. It’s really just a matter of time commitment, and if you’d like to help out with testing post-processing technologies, we could use the help! sandblasting (sugarblasting), ultrasonic cleaning and deburring, vibratory polishing, wax dipping, heat annealing (Kitchen oven! ), investment casting: Plaster, wax, aluminum, steel, pewter, bronze, plastic clear coats, and so on. Maybe I should add chocolate coating to the list too. How about a 3d fractal? I do 3d renders from actual meshes of fractals. there’s a company that can ~print~metal sculptures. Said it would be no problem as long as the file was in the right format. Now that would be a challenge!! !